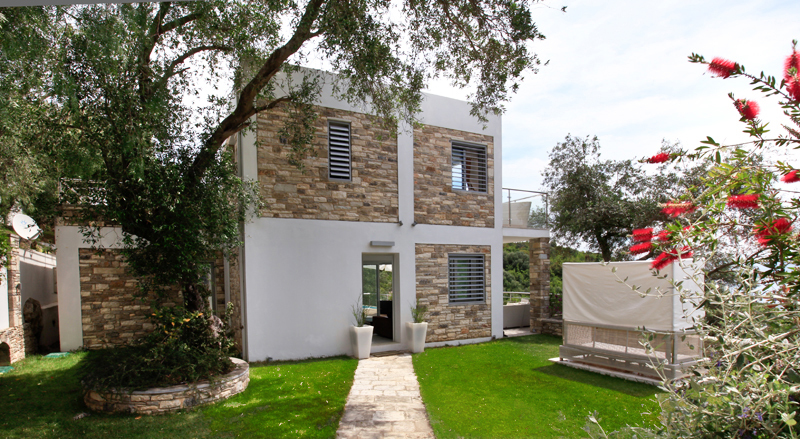 Villa Moonstone is an unusual villa with linear architecture, wide openings, built with grey stone and white walls, reminiscent of the cuboid whitewashed houses of the Aegean Sea. 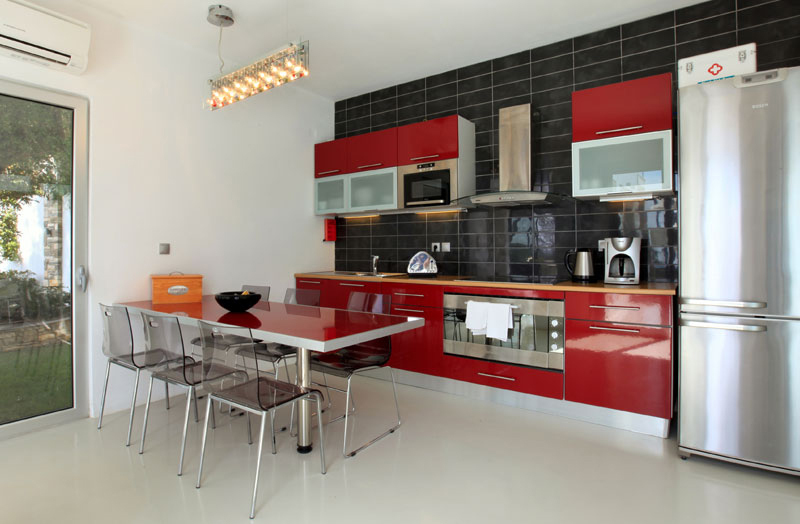 Interior design enthusiasts will appreciate the industrial decorating with splashes of pop influences. 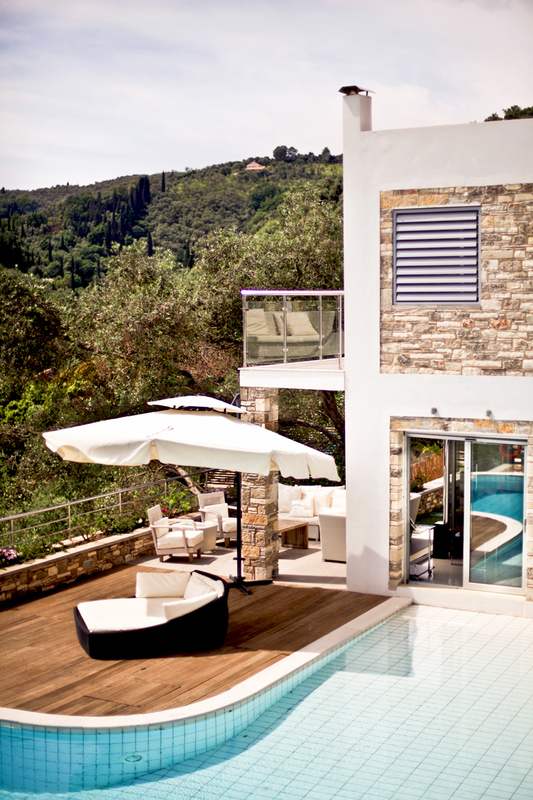 This villa is a stylish modern house clinging to the hillside behind ever popular Agios Stefanos. 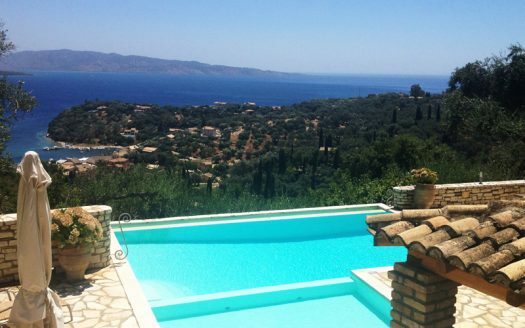 Offering lovely views over the olive-clad hillside down to the harbour below, the villa has varied outside areas enabling you to enjoy sun or shade at different times of the day. The wooden pool deck houses a heatable Jacuzzi and the beach slope of the main pool comes right up to the living room patio doors. Extremely comfortable terrace furniture provides the perfect spot for an early evening drink. The interior of the villa is striking, with white as a background and splashes of color and pattern giving contrast. 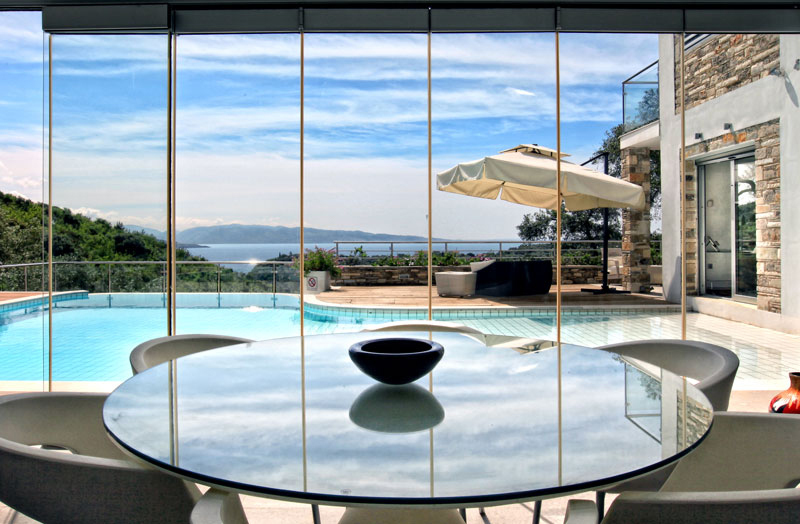 One of the most unusual features is the indoor/outdoor dining area, shaded by a pergola and with glass doors which can be open to the pool, or closed, according to the weather. This area also houses a barbecue. 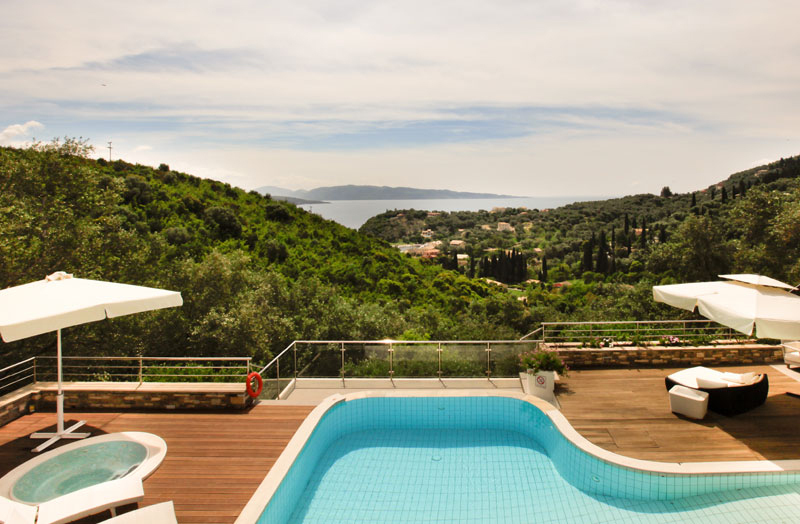 This villa offers a different feeling to the predominately Corfiot houses in the area and will provide an attractive alternative for discerning visitors. 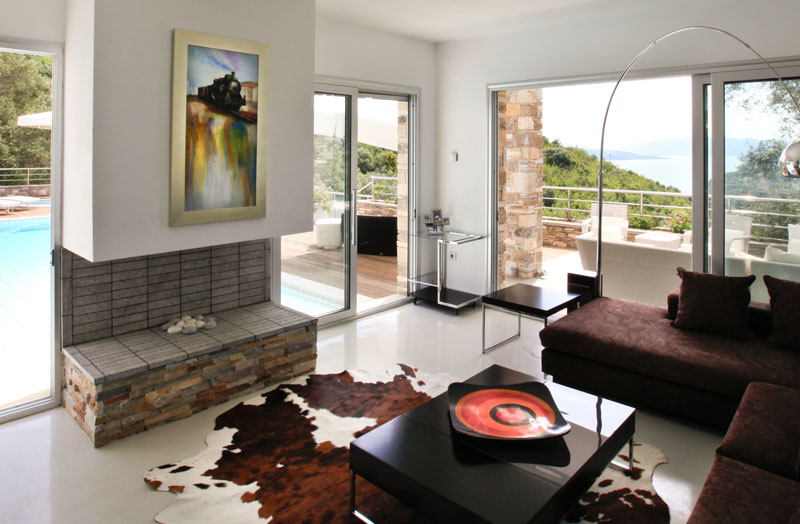 Sitting room with fireplace opening onto pool and terrace. Ultra modern kitchen. Indoor/outdoor dining room with barbecue. Outside access to two bedroom suites (these can be interconnecting but also both have separate outside access). 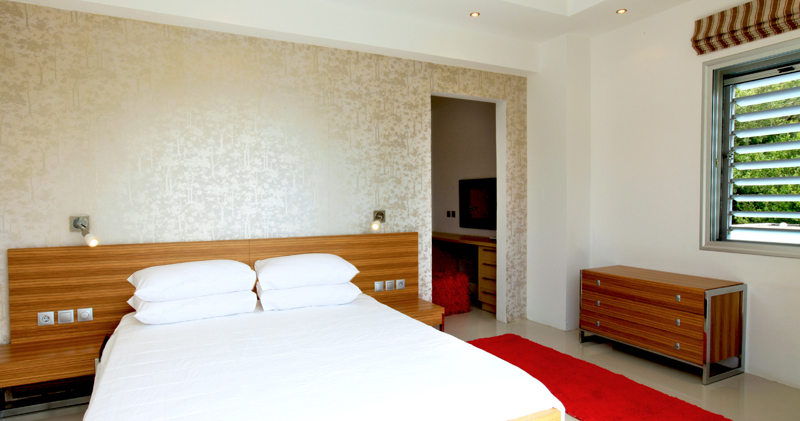 Double bedroom with en suite shower room (separate WC) and twin bedroom with en suite shower room. Stairs from the living room lead to the first floor Master Suite. Double bedroom with en suite shower room (separate WC) and small study area. 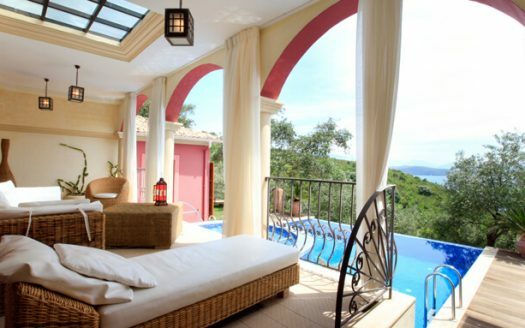 Sea-facing balcony. This level also offers a large sunbathing terrace.